Trastevere is one of the most lively neighborhoods in Rome. Fascinating and cozy during the day, it is pretty much the heart of roman nightlife at night. The neighborhood's appeal stems from its labyrinth of narrow and windy alleys that usually end up in one of the several squares. 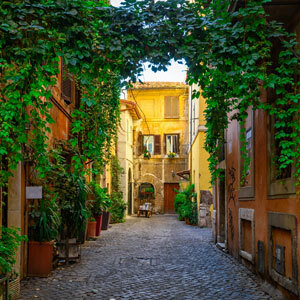 Trastevere is a maze of cobblestone-paved alleys on which buildings covered by ivy stand tall. Sometimes the buildings are "connected" by ropes where laundry hangs on. Trastevere features small shops, workshops, coffee shops, trattorias where you can have traditional roman food and bars where you can watch sports during the evening. Culture and nightlife. During the day Trastevere allows you to visit some of the most beautiful churches of the capital, admire reenactments of the '800 daily life, take long walks and sit down in the outdoors and enjoy a drink or a ice cream. When the sun sets it becomes the heart of roman nightlife. The streets fill up with youngsters, stands, street artists. And the clubs serve aperitivo, dinners and shots. Piazza Santa Maria in Trastevere. The square features the Basilica di Santa Maria in Trastevere and a roman octagonal fountain, restored in 1692. During the day it is a landmark for those who live in the city and those who want to visit churches and museums. At night it's a hangout for young romans and foreign students that usually sit on the steps to chat away the night. The jewish neighborhood and the sinagogue. Roma hosts the oldest jewish community in Europe. The jewish neighborhood is located right in Trastevere. You can visit the sinagogue from Sundays to Thursdays. We recommend you to take a walk in the Ghetto and take a break in one of the many kosher restaurants in the area. Isola Tiberina and the view on St. Peter's. Take advantage of your nice walk to admire the Isola Tiberina (Tiber Island), the only urban island of the river Tiber. This small strip of land features the hospital Fatebenefratelli and the jewish hospital. In the summertime the festival l'Isola del Cinema takes place, a festival that brings both the great italian and international movie tradition in the capital along with several cultural events. Porta Portese Market. It's Rome's fleamarket. It's open on Sundays from 9 am to 2 pm. It's in the area that goes from Piazza Ippolito Nievo to via Ettore Rolli and via Portuense. There you can find articles of every genre: antiques, linen, clothing, home hardware, toys, plants, cds and discs. As in every fleamarket you can negotiate the price or just take a look. Chances are you go just to take a look and wind up going home with a handful of bags. The new Sacher movie theatre. This movie theatre founded by director Nanni Moretti is located in this neighborhood. If you wish to enjoy a good movie this is the place to go. Basilica di Santa Maria in Trastevere. The Basilica di Santa Maria in Trastevere is a can't miss. It was built by Papa Callisto in the third century. Inside the Church you can admire the wonderful mosaics of the Cavallini located in the apsis, a magnificent wooden ceiling designed by Domenichino in 1617 and a pipe organ dated 1702. 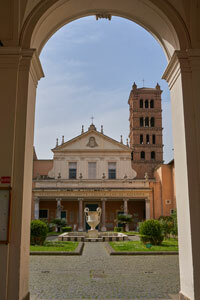 Basilica di Santa Cecilia in Trastevere. In this Church the remains of Santa Cecilia are buried. There you can admire the sculpture of Santa Cecilia that Stefano Maderno dedicated to her. Also check out Pietro Cavallini's Last Judgment and the roman houses still standing in the cellar. There's a 2,50 Euro charge to visit the frescos and the crypt. Rome's museum in Trastevere. The museum features paintings, drawings and watercolors that tell the traditions and daily life of the city. Along the entry staircase you will find the casts of the three talking statues. These are anthropomorphic sculptures on which romans used to attach satyrical notes against the governments. A room of the museum is dedicated to the poet Trilussa, known for his poems in roman dialect. Trattorias and restaurants. In Trastevere there is a wide range of trattorias and restaurants. Restaurants offer a rich menu, a careful service and affordable prices more or less. Trattorias are usually family managed and generally have a more simple menu with dishes of the roman culinary tradition. For more information on trattorias in Trastevere check out this link. The roman jewish cuisine. In the capital the kosher tradition is interwoven with the roman culinary tradition. The end result is a supply of very delicious dishes. The most known specialties are the carciofi alla giudia (jewish style artichokes), fried in olive oil; and the ricotta cheese and sour cherry pie. The sweet pizza. Another classic product of the kosher cuisine developed in Rome is the sweet pizza made with raisin and dried fruit. It's a sweet dish that you will hardly find somewhere else and that we recommend strongly to try. There are a couple of places that sell it by slices in the jewish neighborhood. One of them is Boccione that serves also slices of ricotta cheese and sour cherry pie. The place is always crowded and the service is quick. It's worth going though. The grattachecche stand. It's one of the symbols of Trastevere. The stand is located on the edge of the river Tiber. It's the symbol of the real refreshment for romans during the hot summer nights: the grattachecca, the roman version of the slush with fruit and syrup. The better public transportation vehicles to get to Trastevere are the streetcar and the city train. Streetcar: There are two lines that cross the neighborhood: 3 and 8. The 3 line connects Trastevere to the Colosseum, Piramide, Testaccio and San Giovanni. The 8 line connects Trastevere station and the Gianicolense area to piazza Venezia and largo Argentina. Train: At Trastevere station take one of the trains bound to Fiumicino airport (FL1, every 15 minutes, costs 8 Euros), Civitavecchia (FL5) and Viterbo (FL3). These three trains allow you to reach other areas of the city, at the cost of a city ticket. The FL1 line prior to reaching Fiumicino airport goes through Villa Bonelli, Magliana, Muratella, Ponte Galeria and Fiera di Roma. In the other direction it stops at Ostiense station, via Tuscolana, Tiburtina station and via Nomentana (to reach Orte). The FL3 to Viterbo goes through via dei Quattro Venti (Monteverde), St. Peter's, Valle Aurelia, Balduina, Policlinico Gemelli, Roma Monte Mario, hospital San Filippo Neri.